You’re camping, having a great time with friends, and while taking a walk deep into the forest near a river, you feel something bite your arm. Ouch! It’s a mosquito bite. Mosquitoes are especially common near areas of swamp-like conditions and stagnant water. Nobody likes it when the mosquitoes are biting or any insect bite in general. However, they come with the territory that is the summer season and being outdoors. Although you may not notice at first, hours later, you find a nasty bump that is quite itchy, sore, and swollen. Mosquitoes leave an annoying bump that may even last days after the bite. Fortunately, homeopathic remedies offer a safe and effective option for treating not just mosquito bites, but other insect bites as well. 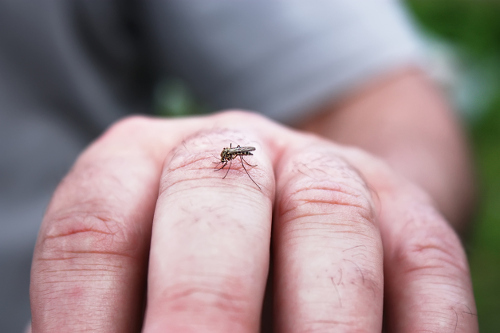 Read on to find out more about mosquito and insect bites, and how homeopathy can help treat them. What Are Mosquito and Insect Bites? What are mosquitoes exactly? The mosquito requires water to live, but the adult mosquito may rest in grass or shrubbery areas during the day. It is thought that only the female mosquitoes bite, and she will live just three weeks in the summer. She is attracted to humans, birds, and mammals. They may also live for a few months of the winter to lay their eggs in the spring. The male mosquito is the kinder gender since he is just interested in plant juices. Mosquitoes are seen in tall grasses and weeds near buildings and other structures since they are attracted to water found in birdbaths, buckets, septic seepage, rain gutters, and other materials that hold water. As a result, it is a good idea to keep anything that can hold water clean and out of the way of rainwater. The reason mosquitoes bite in the first place is they are attracted to the blood, sweat, body odor, and lactic acid of humans. The majority of mosquito bites are harmless, but sometimes you may have a negative reaction such as a swollen throat, difficulty breathing, or hives. Mosquitoes can also carry diseases like filariasis and malaria, as well as viruses known as Zika and West Nile. The likelihood of being infected by a mosquito often depends on where you live, or where you vacation. For instance, the Zika virus is currently active in the Caribbean and Latin America. At the same time, since there is not a dependable treatment for these possible severe cases, it is just best to avoid mosquito bites altogether. What other insect bites are you likely to find while outside in nature? Another insect bite you may have experienced is a bee sting, where a honeybee or bumblebee leaves its stinger and attaches a venom sac to the skin. In most cases, the sting merely creates slight swelling, pain, and irritation. However, some people will experience an anaphylactic reaction that requires immediate medical attention. Serious symptoms will include swollen hands or eyelids, hives, dizziness, trouble breathing, nausea, vomiting, diarrhea, cramps, fainting, and even cardiac arrest. A bee sting can even be fatal in people allergic to its venom. Other potential insects also capable of stinging include paper wasps, hornets and yellow jackets, and fire ants, but they do not leave their stingers behind in the victim. Homeopathy is very effective for mosquitoes and other insect bites, especially when you use the best remedy as soon as you’ve been affected. For instance, a study published in the journal Pharmacy & World Science in 1996 indicated that a homeopathic after-bite gel called Prrikweg gel is significantly effective at relieving itching and skin redness associated with mosquito bites. The homeopathic remedies included in the gel are Ledum palustre, Echinacea angustifolia, and Urtica urens. The following are details on the key homeopathic remedies used to relieve itching and other symptoms from mosquitoes and other insect bites. Apis mellifica has been a popular remedy for insect bites and stings since it was first proven to work in 1852. Symptoms present when apis is needed include itchiness, redness, tension, heat, and swollen skin. Hives may also develop after a fever or chill. Symptoms are thought to improve from a cold compress but will worsen from heat or pressure on the affected area. It is also a good remedy to use when you wait for medical assistance or when the person is allergic to bee stings. The best dosage is Apis 30C or 200C for every 10 to 15 minutes, or until the swelling has reduced. Do this three times daily until symptoms are gone. Ledum can be used directly after an insect sting or bite to help decrease pain, itching, or swelling. Ledum is especially useful for mosquito bites. The best dosage is Ledum 30C three times daily until symptoms subside. A cold compress will improve symptoms, but warm air, movement, and the evening are all thought to worsen symptoms. Aconitum napellus is the preferred remedy when shock is associated with the bug bite. Aconitum may be used when the person is panicked or fearful that they may be bitten again. This might be the case during nights when the mosquitoes are biting, or when someone is allergic to bees or other insects. In this scenario, Aconitum should be used right away. Other symptoms may include a burning or stabbing pain, along with numbness, tingling, or swelling. Cantharis is often the recommended homeopathic remedy for an unusually sharp, scalding pain at the site of an insect sting or bite, especially when there is a black center. After the bite, common reactions for the person include restlessness, anger, excitability, and aggravation. There may also be red inflammation and blisters. Symptoms will worsen from warmth or coffee; however, they improve with a cold compress on the affected area. Carbolicum acidum is the go-to remedy when there is a severe allergic reaction to bee stings or other insect bites. Homeopathic carbolic acid is also used heavily for breathing problems due to anaphylactic shock. You can give carbolic acid to a person when they on the way to the hospital, or awaiting an epinephrine ejection. Other symptoms include a choking feeling, hives, sleepiness, weakness, and a red face with a pale mouth and nose. Lachesis is an appropriate homeopathic remedy for all types of bites, especially ants. The skin may be red and swollen, accompanied by a shooting, throbbing, or burning pain. The symptoms will be worse at night and when there is pressure on the affected area, as well as exposure to heat. It is best to meet with a qualified homeopath to help determine what remedy is best for your symptoms. Urtica urens is a useful remedy for red blotches that itch and burn intensely after an insect bite. Also, Histaminum will relieve allergic reactions from insect bites like hives or hay fever. Other homeopathic remedies used for mosquitoes and insect bites may include Urtica dioica, Arsenicum album, Hypericum, Echinacea angustifolia, Hepar sulphuris, Calendula officinalis, Silicea, Staphysagria, Formica rufa, Vespa, Arnica, and Caladium seguinum. What other natural remedies help relieve symptoms from mosquito bites and other insect bites? Some natural choices include white tea and chamomile tea bags, witch hazel, neem oil, colloidal oatmeal baths, garlic, basil, baking soda, raw honey, activated charcoal, and aloe vera. You can also use essential oils like peppermint oil, ylang ylang oil, citronella oil, and lemongrass oil. Also, try applying ice to the affected area to reduce swelling, and whatever you do, don’t scratch the sting or bite. Doing this can potentially cause more swelling and itching, and may increase the chance of infection. Balch, J., et al., Prescription for Natural Cures: A Self-Care Guide for Treating Health Problems with Natural Remedies Including Diet, Nutrition, Supplements, and Other Holistic Methods (Hoboken: John Wiley & Sons, Inc., 2004), 99-101. Hershoff, A., N.D., Homeopathic Remedies: A Quick and Easy Guide to Common Disorders and Their Homeopathic Treatments (New York: Penguin Putnam Inc., 1999), 248-249. Lockie, A., Encyclopedia of Homeopathy: The Definitive Home Reference Guide to Homeopathic Remedies and Treatments for Common Ailments (New York: DK Publishing, Inc., 2000), 104-105. Hill, H., et al., “The efficacy of Prrrikweg gel in the treatment of insect bites: a double-blind, placebo-controlled clinical trial,” Pharmacy World & Science, January 1996; 18(1): 35-41. http://www.ncbi.nlm.nih.gov/pubmed/8861830. Bledsoe, A.,“What Bit Me? Spot These 12 Bug Bites,” Everyday Health, June 5, 2017; http://www.everydayhealth.com/skin-and-beauty-photos/how-to-identify-common-bug-bites.aspx#10, last accessed June 27, 2017. Fanous, S., “6 Home Remedies for Mosquito Bites,” Healthline, May 26, 2015; http://www.healthline.com/health/outdoor-health/home-remedies-for-mosquito-bites. Adkins, S., “Homeopathy for Insect Bites and Stings,” The Homeopathic Coach, 2009; http://www.thehomeopathiccoach.com/homeopathy-insect-bites-stings/, last accessed June 27, 2017. “Insect Bites and Stings,” National Center for Homeopathy; http://www.homeopathycenter.org/insect-bites-and-stings, last accessed June 27, 2017. “Insect Bites and Stings (Homeopathy),” Michigan Medicine, October 31, 2012; http://www.uofmhealth.org/health-library/hn-2238007#hn-2238007-remedy-options, last accessed June 27, 2017. Calabrese, J., “Mosquito Bites? Let Homeopathy and Essential Oils Help,” Joette Calabrese Homeopathyworks, August 28, 2016; https://joettecalabrese.com/blog/mosquito-bites-let-homeopathy-and-essential-oils-help/.